(1849 California Constitution at Monterey) 1849 (Sep.) "San Joaquin Dist., Tuolumne River, Election Returns", docketing on gray folded cover addressed to Hon. B Riley Governor, Monterey, Upper California, privately carried, marked "Rec'd Sept 3d 1849"; minor fold toning, Fine and rare early use. The state was divided into 10 districts - San Diego, Santa Barbara, San Louis Obispo, Los Angeles, Sonoma, Sacramento, San Joaquin, Monterey, San Jose and San Francisco to send delegates to the California Constitutional Convention at Monterey (Sept. 1 to Oct. 13, 1849). General Bennett Riley was Military Governor of California from April 13, 1849 to December 20, 1849. The convention met at Monterey on Sept. 1, 1849 and by Oct. 12th, had formed a State Constitution providing for an American Civil Governor. A month later, the people ratified it and on Dec. 20th Riley yielded his authority to Peter M. Burnett, ending a period of 3½ years of Military Government in California. 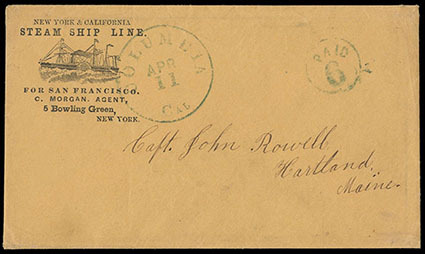 Camptonville, Cal., Dec 24 (Yuba), clear first type cds (YUB-260) on cover to Attica, O., franked with large margin "1855, 10¢ green, type II" canceled by matching "Paid" handstamp; stamp with corner bend slightly creasing at top right, otherwise Very Fine; with 2018 P.F. certificate. Columbia, Cal., Apr. 11 (Tuolumne), blue cds with matching "Paid 6" in circle on cover to Maine with illustrated corner card "New York & California Steam Ship Line., For San Francisco., C. Morgan Agent, 5 Bowling Green, New York" corner card showing steamship, Very Fine and attractive, and scarce early version of design, This steamship line was taken over from Vanderbilt. (See Dec. 1996 Western Express). 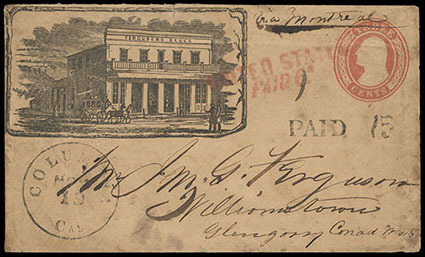 Columbia, Cal., Nov. 19 (Tuolumne), cds on 1853-55 3¢ Nesbitt entire to Williamstown, Canada West with lovely printed design showing Street Scene with "Fergusons Block", handstamp'd "Paid 15" for the West Coast rate to Canada with red two line exchange handstamp "United States, Paid 6d", changed by manuscript to "9"d, reverse with Canadian Montreal & Brockville No. 2 1855 railroad marking & arrival markings, part of flap missing & some soiling, F.-V.F., a rare and attractive usage. Columbia Cal. 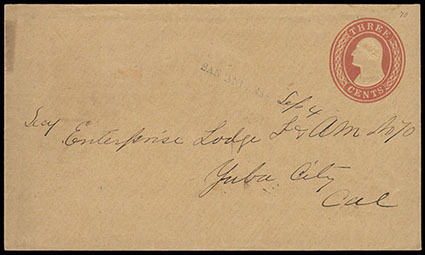 Postal History, 1853-1900s, collection of 45 covers including 1853 manuscript "Columbia Cal" use, 1853 "Columbia, Cal" straightline with "Paid 6" in circle rating handstamp to Me., blue Columbia Cal. cds used with "Paid" and "10" rating handstamps; faulty "Overland Mail via Los Angeles" illustrated stagecoach repaired cover; 1858 w/ two 10¢ #32 singles to Bangor Me. 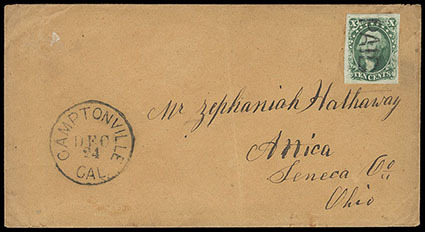 ; 1858 Columbia "Paid 15" use to Nova Scotia; 1859 Columbia "Paid" and "10" rating handstamp to Bloomfield Me. ; #65 eagle and flag Civil War patriotic use, and some modern and commemorative uses, some photos, early receipts and checks, etc., also includes four Culloma covers, F.-V.F. Columbia Cal. 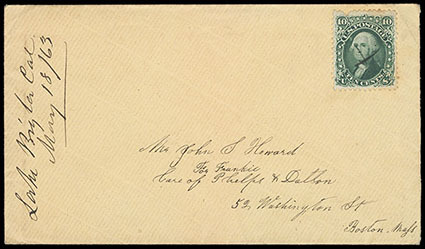 Express Postal History, 1853-1876, collection of 12 covers including 1854 "Wells Fargo & Co's Express, Columbia" oval with #11 to Sacramento; 1853 blue "Adams & Cos. Express, Columbia" oval to San Francisco, blue "Adams & Co., Columbia" oval datestamp to Sacramento; "Freeman & Cos. Express, Columbia" oval use on printed red frank cover to San Francisco, two "Pacific Express Co., Columbia" oval uses including one with running horse frank, couple Wells Fargo frank covers with printed corner cards of Philip Schwartz and Travellers' Home, etc. ; also includes some Wells Fargo checks and receipts. Jose Marcos Mugarrieta Correspondence, small group of documents and covers from the 1860's to Mugarrieta at the Mexican Consul in San Francisco; includes 1863 "Oetling & Co., Manzanillo" forwarder cover, 1860 Veracruz folded letter privately carried via "A.C. Bruguiete, New Orleans" and posted in New Orleans with 10¢ (Scott 35), also a 1861 incoming cover with blue eagle legation handstamp endorsed "By the overland Pony Express" (stamp torn off), a Fine group. "Lake Bigler Cal, May 18/63" (El Dorado), manuscript postmark at left and matching ms. cancels 10¢ green (68), rich color, on light buff cover to Boston Mass. 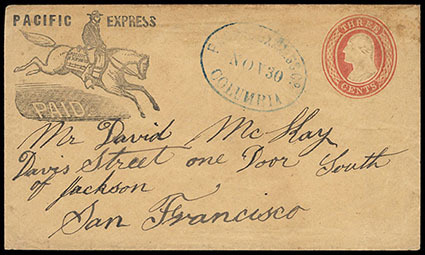 ; 10¢ nicked at top, otherwise Very Fine, One of the most desirable postmarks of California. 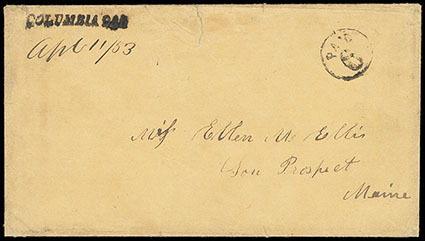 Nevada collectors believe this cover was sent from what is today's Glenbook, Nev. area. In 1861, Lake Bigler, Lumber Co. was established there to furnish lumber to the Comstock Lode mines. In 1863, the Lake Bigler Toll road was completed at nearby King's Canyon to Friday's Station, Nevada Territory. John Bigler, California's Third Governor 1852-1858, led a rescue party into Lake Valley in the winter of 1852 to bring out a snowbound group of emigrants. The lake was called "Bigler" in his honor. The Washoe Indian "Tahoe", meaning deep or blue water became popular in the late 1860s and 1870s. 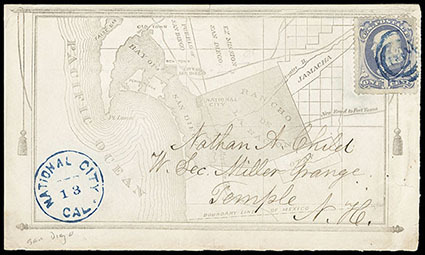 National City, Cal., Sep. 13 (San Diego), bold blue cds (SAN-3360, R4) with matching target handstamp tying 1¢ Banknote on allover San Diego map cover to Temple, N.H., Very Fine and attractive, one of two known on cover strikes of this rare postmark, with the other strike known in black, ex-Tatham; with 2016 P.F. certificate. Scott No. 156 Estimate $200 - 300. 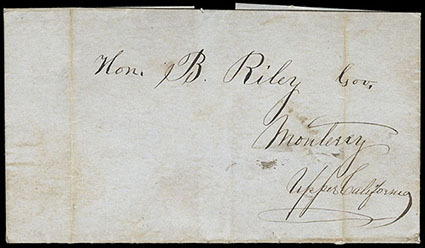 San Andreas, Sep. 4 (Calaveras), straight line postmark (Williams CAL-2420) with manuscript date on 1853, 3¢ Nesbitt entire to Yuba City, Cal., somewhat light but all letters readable, strike in a new variant on William CAL-2420 without the month printed; small stain at left, Very Fine, one of the rarest California straight line postmarks.